5.1. About two in three Americans think global warming is affecting weather in the United States. 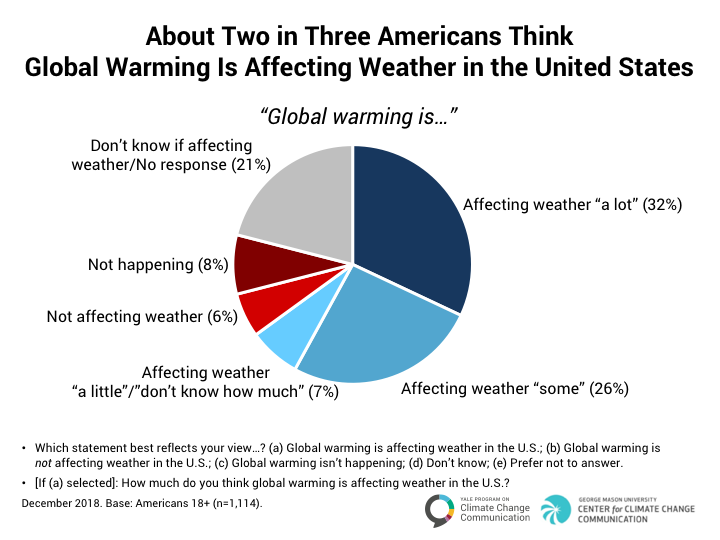 About two in three Americans (65%) think global warming is affecting weather in the United States, including more than half (58%) who either think global warming is affecting U.S. weather “a lot” (32%) or “some” (26%). 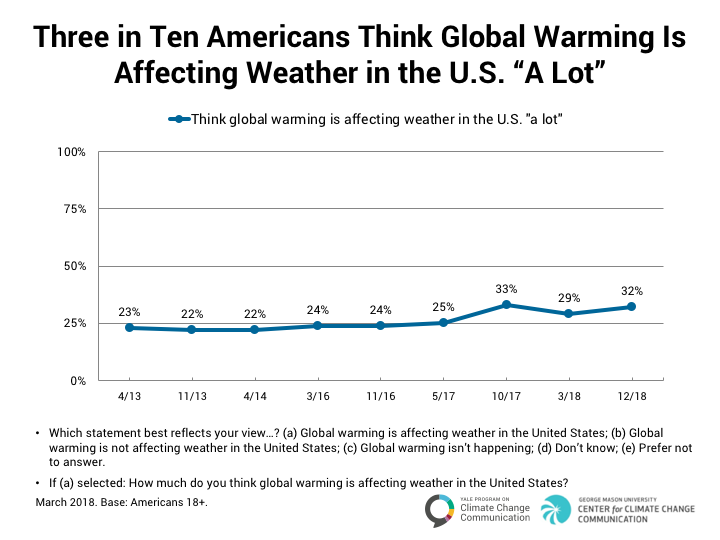 The percentage of Americans who think global warming is affecting weather “a lot” has increased by three percentage points since March 2018. This is the second-highest level since 2013, second only to our October 2017 survey (which was conducted after a summer that included severe hurricanes, wildfires, and other extreme weather events). 5.2. 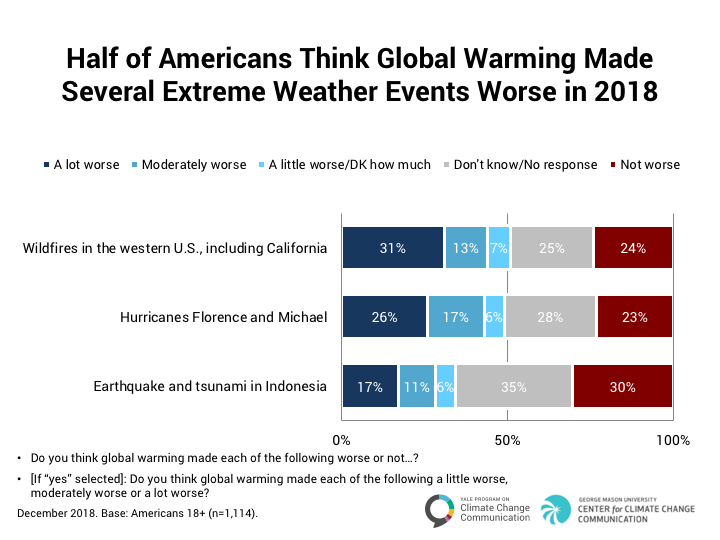 Half of Americans think global warming made several extreme weather events worse in 2018. Half of Americans think global warming made several extreme weather events in 2018 worse, including the wildfires in the western U.S. (50%; 31% “a lot” worse) and hurricanes Florence and Michael (49%; 26% “a lot” worse). About one in three (34%) think, incorrectly, that global warming made the earthquake and tsunami in Indonesia worse. 5.3. 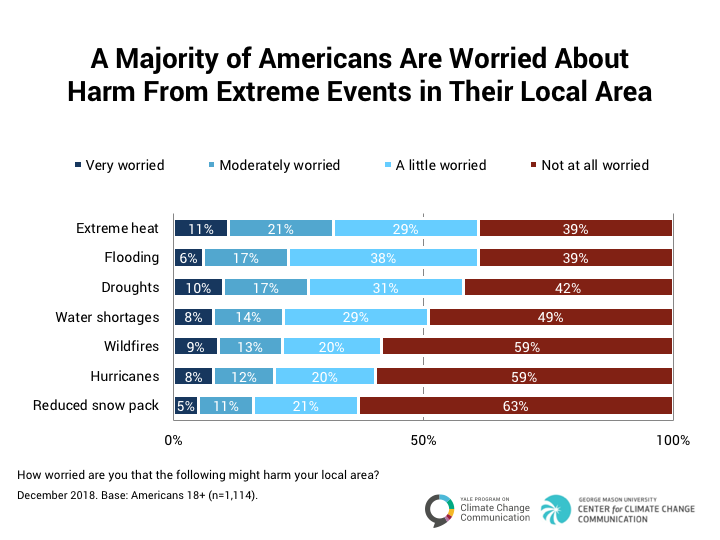 Majority of Americans are worried about harm from extreme events in their local area. A majority of Americans are at least “a little worried” about extreme events in their local areas, including extreme heat (61%), flooding (61%), droughts (58%), and/or water shortages (51%). Fewer are worried about wildfires (41%), hurricanes (41%), and/or reduced snow pack (37%).